Need a 20-minute dinner that has all-family appeal? Our Pork, Snow Pea & Mushroom Stir-Fry fits the bill. 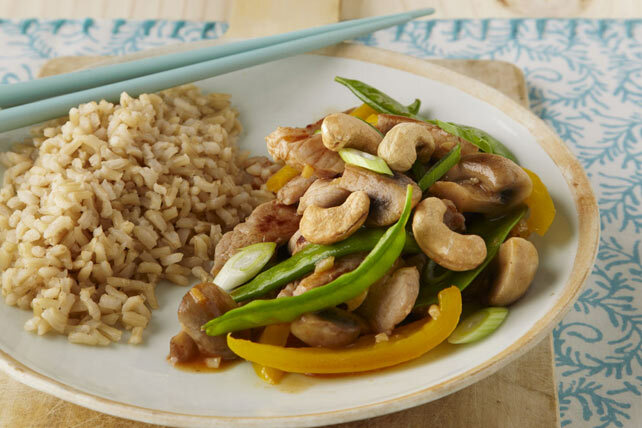 Pork tenderloin is stir-fried with mushrooms, crisp snow peas and yellow peppers, topped with crunchy cashews and served with a side of brown rice - what's not to love? Heat oil in wok or large skillet on high heat. Add meat; stir-fry 1 min. Add next 5 ingredients; stir-fry on medium-high heat 3 to 5 min or until meat is lightly browned. Stir in dressing and soy sauce; stir-fry 2 min. or until vegetables are crisp-tender and meat is done. Top with nuts and onions. Serve with rice. This easy-to-make stir-fry is sure to please both family and friends. And as a bonus, the colourful yellow peppers provide an excellent source of vitamin C.